Like reggae music, country isn't a genre you find on the ARIA top 50 singles chart that often - but when a country (or reggae) song does appear, it's inevitably massive. Think singles like "Islands In The Stream", "How Do I Live" or any number of Shania Twain hits. In 1992, the world was subjected to a country song that gave new meaning to the word "hit". An absolute monster of a record (in every sense of the word), it made its singer an instant star and dominated the number 1 spot for weeks and became the year's overall biggest seller. Another hideous song was the highest-selling single in the country again this week in 1992. "Amigos Para Siempre (Friends For Life)" held on to the number 1 spot for a third week. After two songs that narrowly missed the top 50, the fourth single from the recently released Revenge! album made a more understated showing - and would be the trio's final chart appearance. Meanwhile, another local band gained their first foothold on the top 100 with this self-titled EP, which was led by jangly, indie/dance track "The Bluff". This hip-hop rant about the negative impact of TV (previously recorded by frontman Michael Franti's previous group, The Beatnigs) was TDHOH's only top 100 single. Michael would have more success in a decade's time with his next act. It's the only Pearl Jam song I like, so naturally the grunge band's third single missed the top 50. "Jeremy" was inspired by the tragic story of a high schooler who shot himself in class, an event that was depicted in the MTV VMA-winning music video. "Remedy" had proved to be the breakthrough single for the Southern rock band, but chart success was short-lived with this distortion-heavy follow-up placing them back outside the top 40. Ratcat had an amazing 1991, topping the singles chart twice - once with EP Tingles and again with single "Don't Go Now" - and also reaching number 1 on the albums chart with Blind Love. Following that up was going to be tough, and I'm not convinced "Candyman" was the song to try and do it with. Yes, Ratcat's indie guitar sound was present and accounted for, and the song had a fun lyrical nod to "The Candy Man", but it just felt a bit under-cooked. 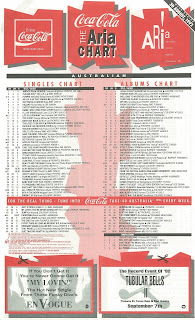 Seems Australia agreed, with the lead single from the forthcoming Insideout barely making the top 40. Here's another song with a link to a childhood favourite. In fact, as its title made obvious, this rave track sampled the theme tune to enduring kids' series Sesame Street. In the UK, "Sesame's Treet" was one of countless dance releases that sampled children's shows and computer games - everything from The Magic Roundabout to Tetris. In Australia, we were spared all those, but given the popularity of the ABC favourite, there was no way this wasn't going to be huge. Basically a novelty record, it also pretty much guaranteed Smart E's would never be taken seriously afterwards and they wound up as a one-hit wonder. Next up, a man generally considered to be a one-hit wonder, although he doesn't meet my strict criteria. And what a hit it was - 1992's biggest, as it would turn out. Not because it was a good song, mind you, but because it was another almost novelty record. In this case, it was one that tapped in to the growing line dancing craze. The debut single by country newcomer Billy Ray Cyrus, "Achy Breaky Heart" was actually a cover version. First recorded as "Don't Tell My Heart" by The Marcy Brothers, who sang "my achy, breakin' heart" instead, the song was renamed and its original lyrics as intended by songwriter Don Von Tress restored. As well as being dance routine-ready, the song gained much of its appeal by being part of what's been termed "new country" - a poppier, more polished style of song than the country music of decades past. New country had mainstream appeal, with "Achy Breaky Heart" spending seven insufferable weeks at number 1 in Australia and becoming one of the first singles to achieve triple platinum accreditation locally. 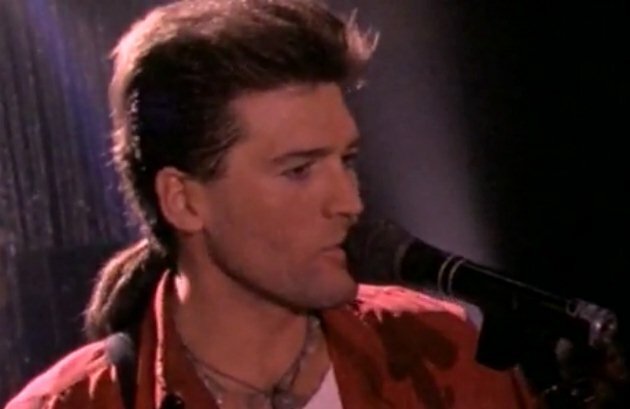 As for the mulleted wonder himself, Billy Ray Cyrus may have only had one more minor hit in Australia, but "Achy Breaky Heart" and his debut album, Some Gave All, which spent 17 consecutive weeks at number 1 in the US, were so massive he was set for life... or until his offspring - Miley was born later in 1992 - were old enough to help him enjoy a resurgence in interest. From one mullet to another, now, and if "Hazard" had been the type of song no one expected from Richard Marx, then follow-up "Take This Heart" was exactly the type of sing-along pop/rock anthem he'd made a name for himself with originally. On the ARIA chart, it appeared as a double A-side with his recent chart-topper, although it would seem this wasn't because "Hazard" was featured as a bonus track on this new single. Instead, both singles were packaged up in a two-for-one offer than can only have helped boost "Take This Heart" towards (but ultimately just short of) the top 10 and brought about the quick demise of "Hazard", which fell swiftly down the chart. Next week: a massive hit from the '70s returns thanks to a massive movie from 1992, plus another film spawns a huge duet and a former backing singer becomes a solo star. Yeah I agree. Haven't had a look on the entries outside the top 50, but the new entries are quite bland & the Sesame Street song was abysmal. However it was another decent hit by Marx, I quite like Take This Heart. 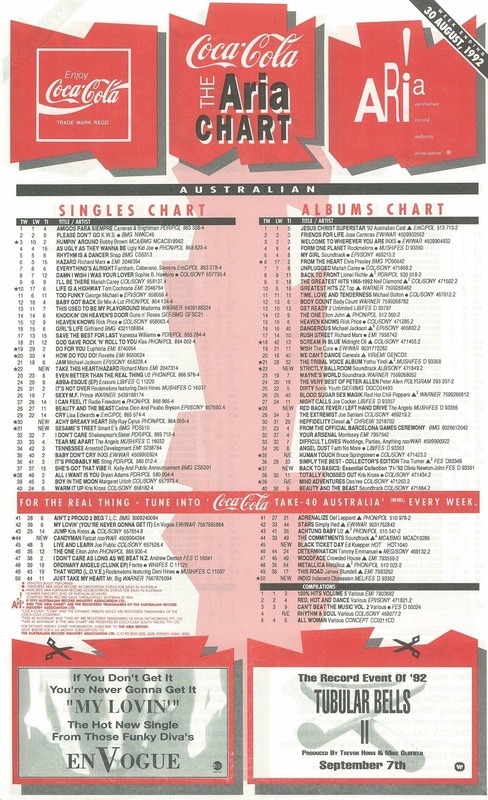 How odd that En Vogue's "new" single 'My Lovin'' appears as single of the week, in its 6th week in the top 50 and dropping. Like Brad, memories of '92 are often better than the (chart) music of the time; especially in the second half of the year, when we seemed to embrace American music even more, including country. Ugh. Although on the positive side, for me anyway, it seems that some 'rave' tracks were crossing over here finally, even if bordering on novelty (Smart E's). I remember seeing the Disposable Heroes of Hiphoprisy video several times on the SBS Sunday afternoon music video programs 'The Noise' and 'M.C. TeeVee'. I hate 'Jeremy'. The only Pearl Jam track I like is 'Go'. If I remember correctly, the 'Jeremy' single was certified gold at some point in the future, despite its low #68 peak. I guess they were the sort of act who might sell singles in small quantities continuously over a long period - I think I remember seeing their singles still in the shops years later. 'Holiday' should have been the lead single from this Ratcat album, though I guess they wanted to get some indie 'cred' back. While I like 'Sesame's Treet', the flop follow-up, 'Loo's Control', was a much better track, and is well worth checking out if you like dance/rave tunes (or 'choons') from this era. When I first heard 'Achy Breaky Heart', I thought it was so laughably bad that there was no *way* it would become a hit in Australia... so of course it wound up as the biggest single of the year. I think this was the moment I realised beyond any doubt that the Australian public have no taste. I agree with Nathan, "Achy Breaky Heart" was abysmal. The only version I can stand is Weird Al's parody, "Achy Breaky Song", the only one of his parodies to really take a dig at how bad the original song is. I still quite like the subtle joke in the "Sesame's Treet" video where they list "A is for this, B is for that" and so on down the alphabet using mostly 'rave'-related terms, but they leave out one letter -- E.
Was Tubular Bells II really "The Record Event of '92"? I remember Tubular Bells II being hyped in the free Brashs magazine. I think there was even a wrap-around mock CD cover for it attached to the cover of the magazine. Can't say I ever heard anything from the album.